Is The BP Oil Spill Settlement Money Being Well-Spent? Gulf states are starting to spend the first of billions from BP's settlements and fines for the worst environmental disaster in U.S. history — but not all the money is being used for restoration. Louisiana is in line for the biggest share of fines and settlements because it had the most damage in the spill. The restoration effort in the Caminada Headlands is one of the largest coastal restoration projects ever in the state. Louisiana, which suffered the most damage in the spill, has used the fines and settlements to rebuild its coast, one that was already fragile and disappearing. When it took a direct hit from the BP disaster, oil choked off vegetation that is critical to holding together what land is left. Fourchon Beach on the Caminada Headlands "was and has historically been one of the fastest-eroding beach headlands in North America," says Joni Tuck, grants administrator of the Greater Lafourche Port Commission. It was down to a narrow strip held together by vegetation. "If you looked at it from above, there would have been no sand. It would have just been just marsh, mangroves, plants, ocean," Tuck says. The Gulf had cut through the marsh, and just beyond is Port Fourchon, the south Louisiana port responsible for about one-fifth of the nation's oil and gas production. To protect it, the state used $145 million from a criminal settlement stemming from the oil spill. Sand was barged in from offshore to build back 13 miles of beach. Tuck says it's the single largest coastal restoration project ever built in Louisiana, and shows how the billions coming from the BP spill can make a difference. "This is the best opportunity to put a down payment on our coast's future that we're ever going to get," she says. 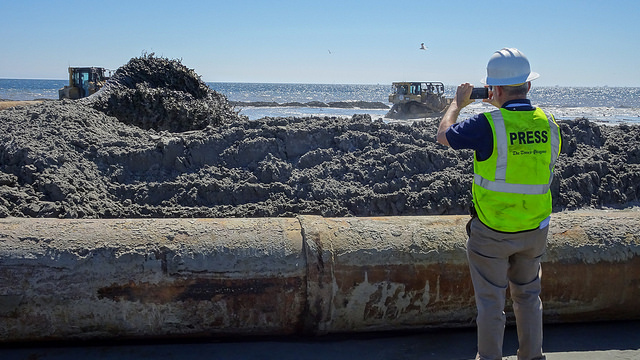 The state has a framework for using the money because it already had a long-term restoration plan to combat the coastal erosion crisis. Other states, however, are not as focused. "Mississippi and Alabama, in my opinion, are doing the worst," says Cynthia Sarthou, director of the Gulf Restoration Network. She says the temptation is to use the money for pet economic projects instead of long-term environmental restoration. "I love the environment, but a lot of people live off the environment and so for us, it's both critical to our way of life and to our economy," she says. "And this is an opportunity to do it right." Following the money isn't easy. It's coming from several places. The states are receiving the money from several settlements: There is the big $20 billion civil settlement between the federal government, states and BP. There are also criminal settlements topping $4 billion. Those deals have more oversight than cleanup payments and economic damage claims BP paid directly to states and municipalities. In Biloxi, Miss., the money has been steered to build a baseball stadium. In Louisiana, it was also used to plug a $200 million budget hole, and in Alabama, it was used to repair the state-owned governor's beach mansion. Counties in the Florida Panhandle are worried that the Legislature may loot their oil spill recovery funds. One project in Alabama is generating the most controversy — a beach lodge at a state park using $58 million set aside to restore natural resources. The beach lodge was not there during the oil spill in 2010, but had been destroyed by Hurricane Ivan six years earlier. The project director, attorney Cooper Shattuck, defends the plan. "This is an environmental project," he says. Shattuck says the hotel will compensate for the human use that was lost when tourists stopped coming to the Alabama Gulf Coast because of oiled waters and beaches. "The idea is that we have natural resources for a reason and that's for people to enjoy," Shattuck says. Although federal and state agencies signed off on the hotel as a restoration of recreational use, a federal judge has blocked that allocation, ruling in favor of the Gulf Restoration Network in a lawsuit that seeks to force the state to consider alternatives to the hotel. Alabama could appeal. Just as BP struggled to stop its oil gusher six years ago, states now struggle with what it means to make the Gulf Coast whole. An earlier version of this Web story incorrectly identified Joni Tuck as chairman of the Greater Lafourche Port Commission board of directors. Tuck is actually the commission's grants administrator.